Could this be it? Could this be the end of the competition? Rachel is up 2-0 in the final week with the competition hanging in the balance! If you’re interested in donating to our charity campaign raising funds for Toronto’s Sick Kids hospital please visit our campaign page. The competition is in my hands tonight for the last time in this competition. If I manage to win tonight I will need to win the following two nights, all of which Rachel will get to pick. So tonight I’ve got to make it count. I thought long and hard about my choice and I went back and fourth between new and old games, games I’ve mastered to games I thought I’d have a slight edge. 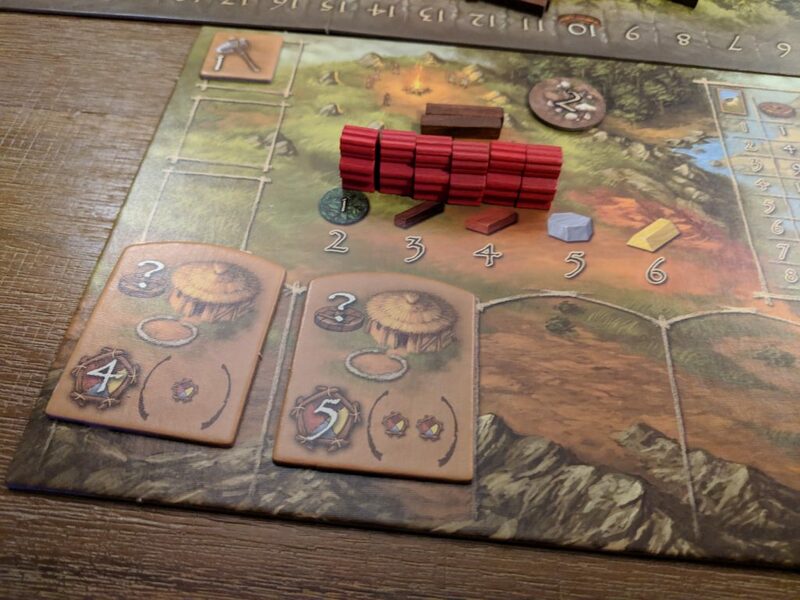 I’ve decided on this must win occasion to make a symbolic choice, I’ve decided to pick the game that introduced me to hobbyist gaming: Stone Age! 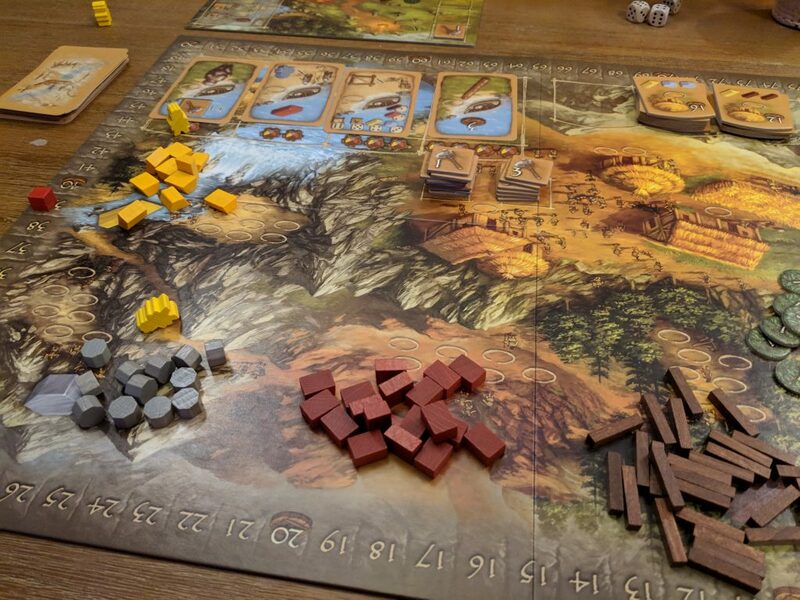 Stone Age is a grand daddy worker placement game where you will place members of a stone age tribe to do various tasks. You can collect resources, build up your farming technology, expand your tribe and ultimately spend the resources to build up your civilization for points. In an era of new hotness where sometimes older games struggle to get to a table Stone Age is a 10 year old classic and should be played. If you’d like to see the game played I recommend checking out this Tabletop video play through. In the first few rounds Rachel and I went back and fourth, staying very close. Then in round three disaster hit. Every round you must feed your people and if you don’t do that you can lose resources or even a large number of points. In round three both Rachel and I were unable to feed our people. I, however was able to pay off the feeding with resources, Rachel could not and took the minus 10 penalty. After that we both struggled to feed our people for a few rounds and Rachel ended up getting stuck below 10 points while I started to zoom around the board. In the later rounds Rachel managed to score two scoring objectives in a turn and did over 40 points in a single turn, but it just wasn’t enough, my lead was unassailable. In the end the final score was a personal best 239-151 for me. I’ve stopped the sweep guys! It’s still a long road for me to come back in the competition and Rachel now gets to pick the rest of the games but I think this might be a win I can build on. No matter what happens the end of this competition is going to be super interesting and competitive!